Tacos! We can’t get enough. 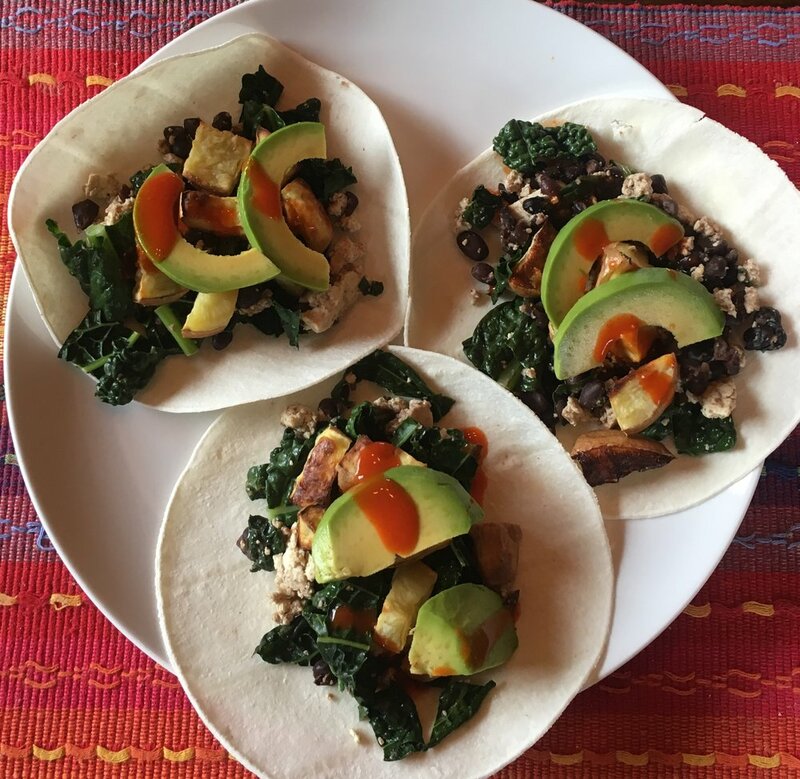 Here’s a veggie-and-protein-packed super-simple taco recipe that’s a real crowd pleaser. Cut sweet potato into small-ish cubes, keeping skin on. Place on a baking pan and drizzle with a little olive, tossing to coat the pieces. Place in oven for about 10-15 minutes, until they’re soft to the touch. While potatoes are baking, heat about 1 T. of olive oil in a pan or wok on medium. Add black beans and crumble in tofu (if using). Stir in cumin and some salt and pepper to taste and let cook for a few minutes. Stir in kale and turn heat to low. (We like to cover it to steam the kale but you don’t have to.) Cook until the kale is lightly steamed, just a few minutes. To serve, layer sweet potatoes, black bean and kale mix, and top with avocados. Add your favorite taco sauce. Here in New Mexico, we make our own hatch green chili sauce, which goes beautifully with the light sweetness from the potatoes.